PESHAWAR -- Potential beneficiaries of an education programme launched by the Khyber Pakhtunkhwa (KP) government for inmates in Mardan Central Jail are excited by the possibilities. "It is the best opportunity for us to get an education during our detention period and to be able to read and write," inmate Johar Khan, 23, told Pakistan Forward. "We are extremely happy and appreciate the move," said Khan, who is serving a one-year sentence for injuring two individuals with whom he had family feud. "We want to fully utilise this opportunity," he said of the programme that launched September 19. "All day we sit idle and have nothing to do. This programme has given me hope of a bright future." The initiative, which aims to increase literacy levels of inmates up to third grade, has been a joint venture of the KP Elementary and Secondary Education Department and the non-profit Vision 21 Foundation. Under the Foundation's Speed Literacy Programme, the government wants to bring positive changes to the lives of people who never had a proper education and were subsequently jailed for committing low-level crimes. KP Education Minister Muhammad Atif Khan said the government wants to empower prisoners to be productive citizens once they are released from jail, enabling them to get jobs or start their own businesses after they complete their prison terms. "In the first phase, a total of 68 prisoners, including 22 females, had been enrolled in basic classes for Urdu, English and mathematics," Khan told Pakistan Forward. "We have also engaged educated prisoners to teach the illiterate ones." "This will not only make them more aware, but also make their mainstreaming into society easier," he said. "Prisoners have a lot of time on their hands in jail ... this programme will ensure that they have something to do, while positively impacting their lives." Teachers participating in the programme are paid Rs. 15,000 ($142) per month, he said, and authorities are actively recruiting more teachers. Khan said the demand for the three-month courses have increased since the programme began. KP Director of Education Rafiq Khattak told Pakistan Forward that the Speed Literacy Programme is a model that will be extended to other jails in the near future. The KP government in May started the programme at the Peshawar Central Prison, where 30 prisoners are receiving education. Muhammad Fahim, a former prisoner with a university degree in economics, is now working as a teacher inside the jail. He said the opportunity to learn is a blessing. "It was a happy occasion to teach and help people reshape their lives. Most prisoners are illiterate and want to be educated," Fahim, who was arrested a few years ago by the Federal Investigation Agency for cases related to human trafficking, told Pakistan Forward. A library has been established at Peshawar Central Prison, he said, adding that about 200 books on various topics are available for prisoners to choose from. Education Minister Atif Khan said a similar library would also be established at the prison in Mardan. "We are excited to receive a basic education," Samina Begum, a prisoner in Mardan jail, told Pakistan Forward. "This basic education can help us, and we can get formal education up to matriculation and beyond." 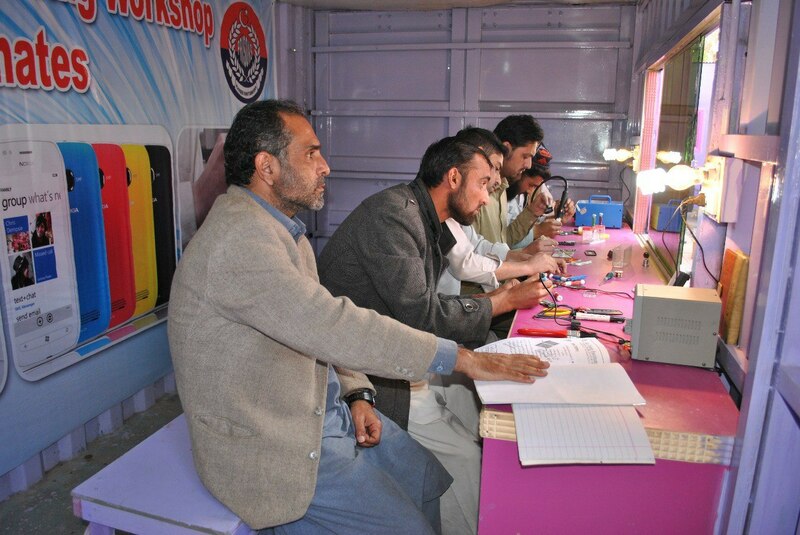 Equipping children with modern technology skills and education is a top priority of the Khyber Pakhtunkhwa government, officials say.